Price boosts are a regular enhanced odds offers bookies use to incentivise customers to bet with them. Several of the major bookmaker brands use price boosts - though some have different names for them. A typical example of a price boost would be in a football market - such as Alexis Sanchez to score first with enhanced odds from 5/1 to 7/1. This is a guide to why bookmakers use price boosts and how matched bettors can take advantage of enhanced odds. Bookmakers target traditional punters (ie, non-matched bettors) using price boosts to attract custom, in much the same way retailers offer more product for the same price. Price boosts also make useful promotional material for bookies - you will often see adverts in print and online shouting about the enhanced odds. They are usually offered on prominent markets, such as high-profile sporting events. SkyBet, for example, almost always offer price boosts on televised matches in the Premier League and Football League. 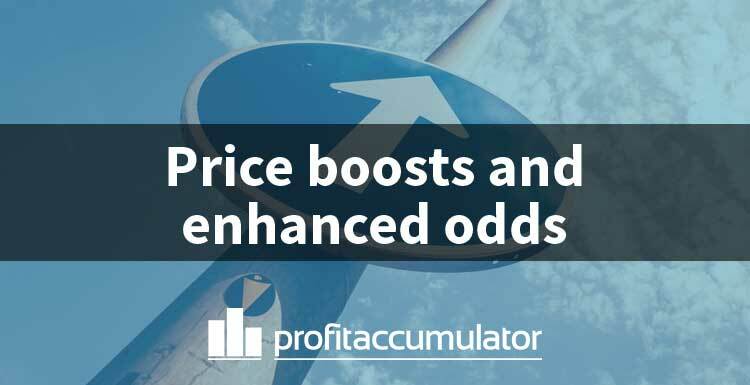 Bookies use price boosts to attract both new customers and to keep existing customers gambling. Firms such as Coral and Betfair often offer massively enhanced odds on bankers to attract new customers. An example might be 50/1 on a goal to be scored in a football match. This is an effective way of catching the attention of a new punter because it's still a gamble, but there's a great chance of winning and it's basically free money. These are usually offered instead of sign-up offers such as 'bet £10, get £30 in free bets'. The price boost offers for existing customers are much more conservative, with examples such as 10/1 being boosted to 12/1. Bookies such as SkyBet, Betway and Ladbrokes also offer price boosts on multiples such as enhanced odds accumulators. William Hill and SkyBet also offer price boosts on a range of outcomes, for example a tennis player to win a set 6-0, 6-1 or 6-2. Some bookmakers also offer limited-time price boosts, enhancing the odds for a limited period of time. These offers are usually available during popular betting events such as the Cheltenham Festival. Betfred have a popular offer called "Double Delight, Hat-trick Heaven" which is a form of price boost that depends on a player scoring two or three goals in a match. Betfred will double the odds or treble the odds if a first goalscorer selection goes on to score twice or complete a hat-trick. DDHH is a popular offer with matched bettors and Profit Accumulator has a dedicated DDHH calculator to help maximise profits from this offer. You should note that bookies will always reserve the right to cancel the price boost promotion at any time, as they are wary of leaving themselves in a vulnerable position if a lot of customers begin piling into one of their offers. For similar reasons, there is typically a stake limit on price boosts, such as a max bet of £20. Whether there is actually any real value in price boosts varies widely. Big brands such as SkyBet, Ladbrokes and William Hill are not renowned for having massively competitive odds on football and therefore, their enhanced odds are sometimes still less favourable than it's possible to get on exchanges such as Betfair and Smarkets. When the price boost is genuinely better value than the market price, this is when matched bettors can take advantage. When the price boost odds are better than the exchange odds, this creates an arb or arbitrage opportunity. Matched bettors are usually advised to steer clear of arbs as it increases the chances of being gubbed. But the difference with price boosts is that the bookmaker is willingly offering more attractive odds, so taking that price will not make matched bettors stand out. In fact, it makes customers appear just like a traditional gambler. As well as arbs, price boosts can help reduce the qualifying loss when matched betting to trigger a bonus. The matched betting calculator can be used in the same way - the back odds just need to be adjusted to reflect the price boost. There is a dedicated section on the PA forum to allow members to share price boosts they've spotted. When taking advantage of price boosts, it's important the back bet and lay bet markets are the same. For example, a bookmaker offering enhanced prices on a team to win both halves is not the same as the HT/FT market in the exchange.